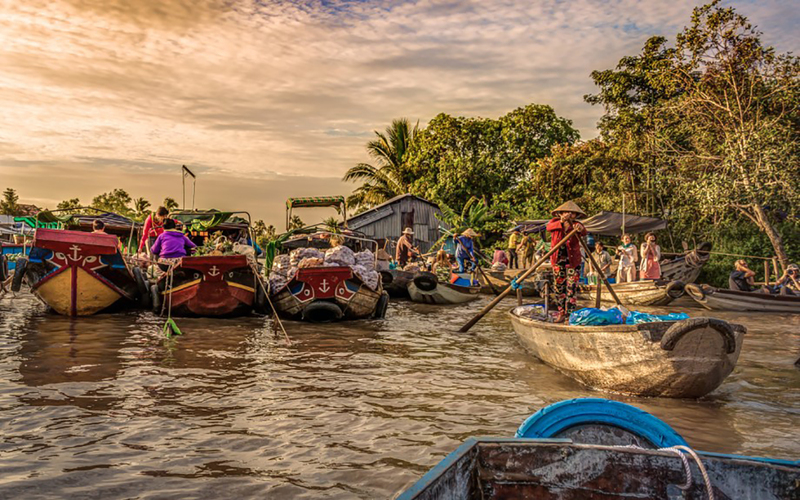 The tour is a combination of visiting a famous floating market, Cai Rang and doing a bicycle trip to ride along the small village in order to get deeply inside of the culture of that area. We will travel by private boat to the floating market first. On the way, driving through the small canals to bring you closer look about the local living style. Then, stop at the rice noodles making place, having traditional Vietnamese noodle soup 'Hu Tieu' and local coffee for breakfast and stop at local fruit garden. From there, cycling around and check out Gian Gua historial relic. To catch the most lively scenes at the markets, tour starts early in the morning, usually around 5 – 5:15am. Description: visit Cai Rang floating market, local rice noodle factory, going through some small canals, fruit garden and having bicycle ride. One way pick up at the hotel in city central (walking distance).